March 20 is the official first day of spring. That means truckers need to be aware of how changing weather will affect their ability to do their jobs safely and efficiently, starting now. This is a good idea at any time of year, but given how much can change from one hour to the next over the course of a few hundred miles, it's even more important in spring, according to CDL Jobs. Spring brings with it not only rain, but also quickly changing temperatures, harsh winds and, in some parts of the country, tornado risk. Truckers need to know what they could drive into at any time, so that they can adequately prepare for whatever conditions they encounter. When high winds are raging, or there's a risk of a tornado, some truckers may believe parking their rigs under an overpass is a good idea, CDL Jobs further noted. This is, in fact, a common misconception. In reality, doing so creates even more risk because, depending upon the direction they're blowing, wind gusts could create wind tunnels that magnify the force. This is another good general rule to follow, but here too, spring means speed becomes extra dangerous, according to National Retail Systems. The reason for this is simple: There's likely to be plenty of standing water in roads, and it's not always easy to tell how deep a puddle is, or whether some parts of it may be mixing with runoff from snow and ice that creates additional slipping hazards. 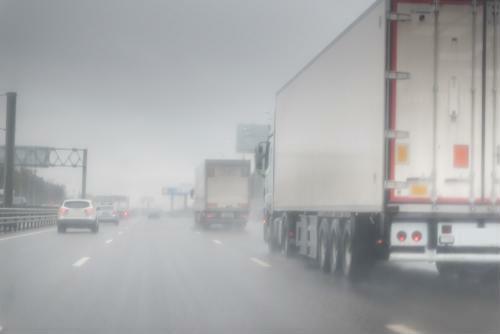 Tractor trailers are at great risk of hydroplaning, so avoiding puddles as much as possible is usually the best course of action. While warmer days usually come with spring, temperatures can still drop quickly overnight in many parts of the country, NRS added. That brings with it the potential for water that melted from snow and ice buildups during the day to freeze once again on the roadway overnight. Truckers need to monitor temperatures overnight (usually possible with a smartphone app) so that they're aware of the risk. When spring has truly sprung, animals get a lot more active than they were when the season began, and that increases the risk that they'll come into roadways and cause a crash, according to Truckers Survival Guide. Signs on the roadside are usually a good indicator that you might encounter deer, moose, bear or other big animal crossings, but it's usually a good idea to keep an eye out for smaller critters as well. Of course, seasoned truckers usually have a pretty good idea of how to operate their vehicles without putting themselves or other drivers on the road in danger. However, a quick refresher is always a good idea as another long, cold winter comes to an end.